Happy Wednesday, sweet friends! I first want to thank you all for all your words of encouragement yesterday via email, tweet, & text -- you all really are the best! I think my practical went well - I dressed cute + I'm sure that helped me from not vomiting before it started (i kid! ha). But that is over, until I find out if I passed or not. I have another test this afternoon, but it shouldn't be too bad. So I will be getting that bad boy out of the way soon + then hopefully enjoyed the rest of my day! On another note, I have sunshine + pretty things on my mind & that is exactly what my four favorites consists of today! ONE / These pretty stella bow flats have been on my wish list for a while now & I might just make them mine in the near future, key word: might! TWO / J. Crew does not wrong in my book. I walk into their store + want to grab everything & try them on in the fitting room. But I know if I do that I have very little will power so I will end up convincing myself that I should purchase everything I tried on & walk out of the store with it, which is a very poor choice for my wallet. But lately, this tortoise flower necklace is just gorgeous & I want it. THREE / Hello Sunshine! I wouldn't mind having this print framed & sitting on my dresser to give me a little bit of encouragement even on rainy days, don't ya think? FOUR / Just last night my mom & I were browsing the internet looking for a tassel garland DIY to make for my graduation party next week & then these magical tassel garland kits popped on up my screen & I just about squealed for excitement. I might just be purchasing some of these kits from Waiting On Martha for my grad party! eek! 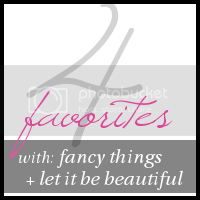 Four Favorites link-up is held on Wednesdays! There aren't any rules: but If you would like to participate in our Four Favorites link-up we would really appreciate it if you followed both Kristin + I and share the button on your Four Favorites post! SIDE NOTE: Please only link-up posts that are relevant to four favorites, others will be deleted. Thank-you for understanding.